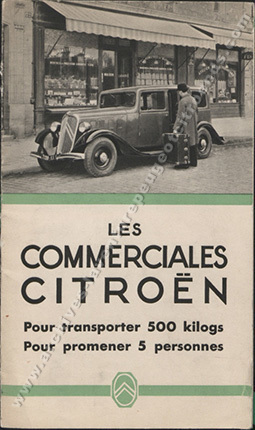 Organized by the Communications Department, photo campaigns were organized throughout France with a chosen vehicle and one or two models. These reports are used to produce advertisements, calendars or posters. They are a moving testimony to the culture of the time, like fashion or cinema. 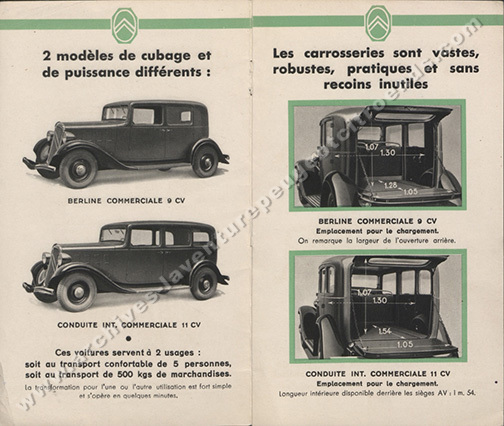 The first photo, on the left, is a report taken in the 1930s by Eugène Michel, an employee photographer of André Citroën’s enterprise, under the direction of Pierre Louys, who was a famous illustrator too. 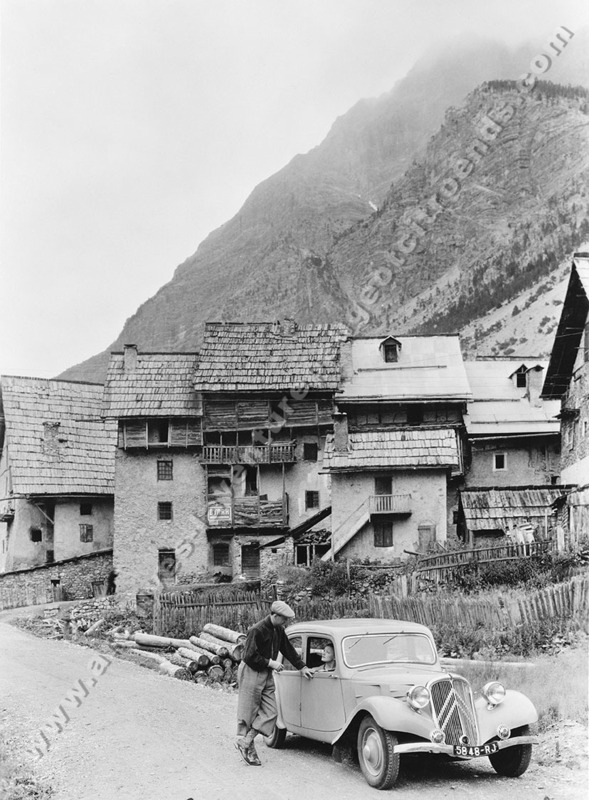 The originals, glass plate negatives, were destroyed because of the bombardments of Citroën factories during the war. 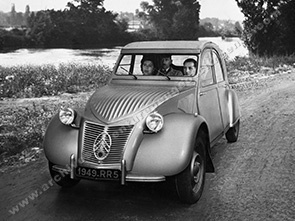 As often after André Citroën's era, old photos are reused, after having been retouched by hand. 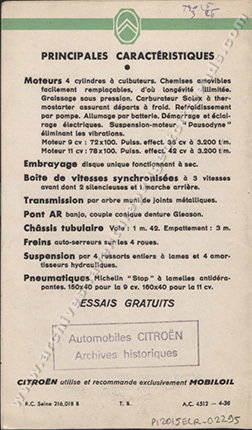 In order to restore the company's financial health, Pierre Michelin has eliminated all expenses considered unnecessary, including advertising. 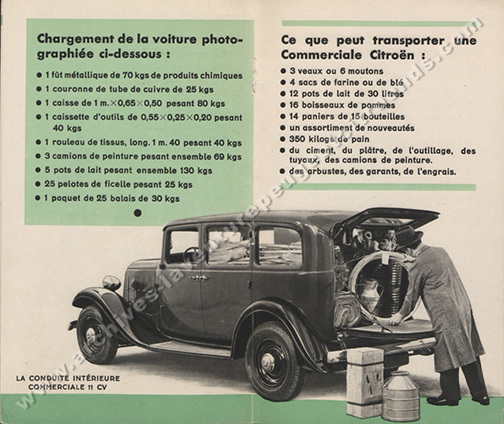 Illustration with two commercial brochure of 1936: the contents of the first brochure illustrate perfectly the use of the photo of reports (photos number 1 to 5below). 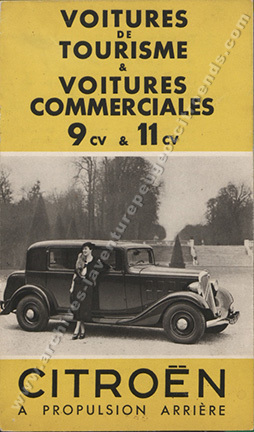 The second brochure (photo number 6) relates to the 9 cv and 11 cv and yet re-use of the photograph of a Rosalie 10 NH of 1934 and not a Rosalie 11 to illustrate the cover. The two last sights (photos number 7 and 8 below) are made starting from the same photo. 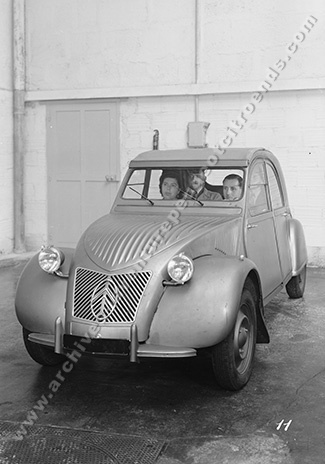 It was one of the first to being diffused for the launching of the 2CV and at the time intended for the press. Note the differences : on one hand, the grille and hood have been modified; and on the other hand, the vehicle has been reattached to another image, to give the impression that the photo was taken in the countryside. In fact, the car hasn’t left the factory and the people on board are... employees of the company ! 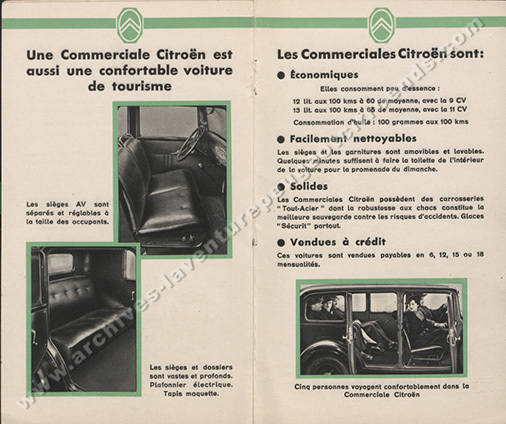 Le Centre d’archives de Terre Blanche a pour vocation de rassembler, conserver, valoriser et mettre à disposition les documents historiques du Groupe PSA et de ses marques actuelles (Peugeot, Citroën, DS) comme passées (Panhard, Talbot, Terrot…).